Progeny Press: Review of “The Green Book e-guide” | My Journeys Through Life . . . Herding Cats In New Mexico! We have once again been blessed to be given by Progeny Press a copy of The Green Book – eGuide for the purpose of this review. I really enjoyed The Green Book! We do enjoy science fiction, and although this is meant to be a children’s book, adults will also enjoy it as well. The story focuses on Pattie, as her family and friends are the last group of people who escape a dying Earth, and then land on their new home. After a four-year trip, they make their new home on the distant planet, Shine. They discover that they are in serious trouble. Pattie and her sister decide to take a dangerous chance that just may save them all. Pattie records the journey and their new life in her little green book, and so we see from her eyes what is happening to them all. The Green Book – eGuide is much like the other study guides we have reviewed from Progeny Press, and you can read those reviews here. They are written with a Christian perspective, and yes, it directs the student to the Bible. The e-guide does use the New International Version of the Bible, but as my readers surely know by now, my family uses only the King James Version. So we simply went to our own Bibles when directed to go to sections of scripture. This e-guide was very easy to simply download and go. All we really needed to provide was a copy of the novel “The Green Book,” and away we could go! Before-You-Read Activities:Read other pioneering books, travel plans, memory photos, make a journal. Vocabulary words used throughout the novel, using a variety of activities to help retention and growth. Literary Techniques: In-context, similes, idioms, metaphor, mood, synonyms, imagery, along with a number of other techniques. Activities and Writing Assignments include things such as: planning forum, computer research, gravity, science and wind, rain cycle, jellyfish, oil lamps, marine aquariums, science video recommendations, fairy tales, boredom ideas, tree candy, hopscotch, cooking grain, pancakes, Venn diagramming and much more! Suggestions for Further Reading: An in-depth reading list is included of more plays by the same author(s) and other books that tie in with, or are similar to, The Green Book. As I said above, the instant download is something I appreciate. There was a time when I actively avoided downloadable curricula, but I have come to see the many benefits of it. I have four kids, at different levels of ability. Downloaded materials allows me to re-use them at different times, when each child is ready, and also allows me to use something with all four at the same time if they are capable. Without having to purchase new consumables, my friends! 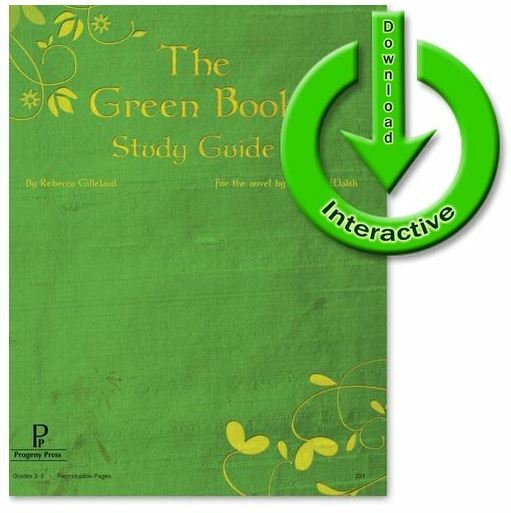 And The Green Book – eGuide is interactive! The student can either have the pages printed out to work on, or they can type answers right into the interactive pdf file, and save their work! I like this feature, it’s great for the student who has trouble with handwriting, or simply doesn’t like to write for very long. Every experience we have had thus far with Progeny Press had been a very positive one! I encourage you to read the views of 65 other Review Crew members about this and the above listed Progeny Press e-guides. You’ll be glad you did! Just click of the banner right below to be taken to the other reviews.